Trader Bakers, a consignment market, and a local Sears store reside in a 30,000 sq. ft. building in Madison, IN. that had a flat, modified bitumen roof over a metal deck. The roof, however, had reached the end of its life. Even though building maintenance tried to patch up the ruptured seams in the modified bitumen with tar, the leaks continued—threatening the inventory and daily operations of both businesses. 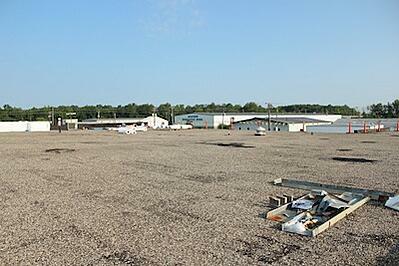 Trader Bakers and Sears needed a roofing contractor with proven experience fixing decaying roofs. That’s when they called Exterior Pro Roofing. The roof over Trader Bakers was in abysmal shape: There were leaks all over the roof, especially in and around the parapet walls. Exterior Pro Roofing noticed that the coping cap—the top of the parapet wall—was rusted out and leaks were damaging the block walls below. This caused a build up of efflorescence—a chemical reaction that happens when water interacts with free lime in the concrete—which told us that water had saturated the blocks. The HVAC units on the roof proved to be another major source of leaks. Due to poor design, the curbs on the HVAC units were too close to the roof, which makes it easier for leaks to develop and grow. Exterior Pro Roofing coordinated with an HVAC company to remove all 15 units by crane, so that the flat roof repair could begin. We installed a ½-in. fan fold insulation to separate the modified bitumen and the 40-mil. Duro-Last membrane we would be laying down. The new membrane was taken up and over the parapet walls, the rusted coping cap removed and a new cap installed to match the building’s color. We then performed a structural infill on the curbs to ensure they were stable and safe. 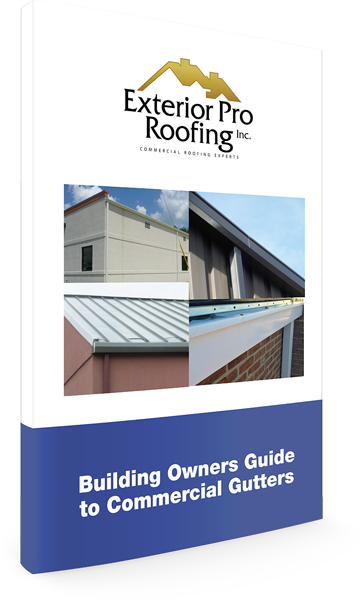 Exterior Pro Roofing used the same ½-in. 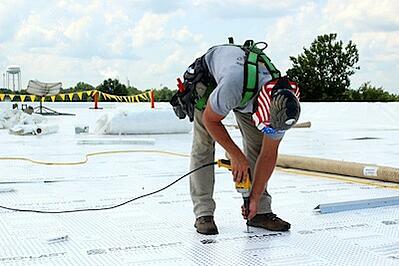 fan fold insulation to cover the entire flat roof over the Sears store, and then applied the 40-mil. Duro-Last membrane. Sears’ HVAC units also had to be replaced, so we worked with the HVAC professionals to install new ones. To complete the job, we ran the membrane up the new curbs to ensure they were watertight. We even went the extra mile to install new metal trims on the building’s front for better aesthetic appeal. All told, the Sears repair took just 2 days longer than originally anticipated, which considering the shifting scope of the project was quite a feat. Exterior Pro Roofing’s expertise and coordination dramatically improved the quality and efficiency of both flat roof repairs. Our decision to work with HVAC professionals reduced the project time, which totaled only 5 days for a complicated repair. It was all done with minimal disruption to daily business operations, leaving both Trader Bakers and Sears happy customers with dry, intact roofs.